Doncaster Rovers zoomed up to 11th in League One courtesy of a thumping win at play-off chasing Southend. 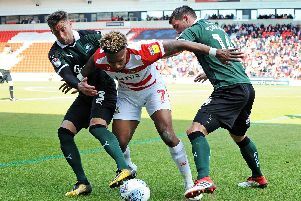 Darren Ferguson’s side were dominant almost throughout the game as they extended their unbeaten away record to six games in some considerable style. Rovers enjoyed much the better of the first period at Roots Hall and deservedly led 1-0 at the interval. The breakthrough didn’t arrive until the 44th minute, though. The recalled Nathan Tyson went on a surging run before crossing in low for Andy Williams, who rifled in an effort from the tightest of angles high into the roof of the net. That was the in-form Williams’ 13th goal of the season, and his 10th in 12 matches. Earlier the Shrimpers’ goalkeeper Dan Bentley was twice tested by Craig Alcock and then skipper James Coppinger as the visitors made an excellent start to the game. Andy Butler headed narrowly over the top, while at the other end Thorsten Stuckmann had to be at his agile best to keep out Jack Payne’s deflected strike. Rovers came agonisingly close to doubling their lead just two minutes after the restart. Paul Keegan did well to find space on the edge of the Southend box before drilling in a superb shot which struck the outside of a post before going behind. The deserved second goal came in the 55th minute. This time Aaron Taylor-Sinclair volleyed home off the underside of the crossbar as he dived in to meet Grant’s precise corner-kick. Three minutes later it was 3-0. Williams - the hosts’ tormentor-in-chief all afternoon - was bundled over by Adam Thompson, and referee Mr Collins pointed to the spot. Up stepped Tyson to coolly beat Bentley and register his fifth goal of the season. Cedric Evina and Paul Keegan both came close to adding to Rovers’ score late in the game as the visitors coasted to victory. Southend (4-4-2): Bentley; White, Thompson, Barrett, Coker; Rea, Leonard, Atkinson, Payne; Mooney, Hunt. Subs: T Smith, Prosser, Worrall, McLaughlin, Deegan, Pigott, O’Neill. Doncaster (3-5-1-1): Stuckmann; Alcock, Butler, Taylor-Sinclair; McCullough, Coppinger, Keegan, Grant, Evina; Tyson; Williams. Subs: Marosi, Chaplow, Mandeville, Lund, Middleton, J McKay, MacKenzie.